Madagascar’s chameleons are known for their splendid color. But its parrots? Not so much. 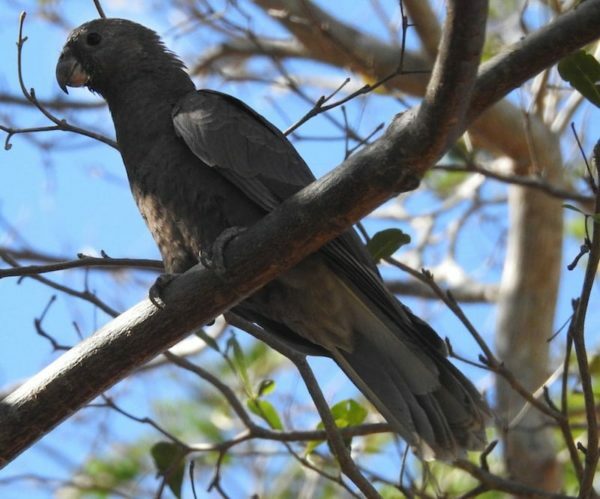 Madagascar has two endemic parrot species, both of them a uniform gray: the Greater Vasa Parrot, and the Lesser Vasa Parrot. Visually, the main difference between them is a few inches. The Lesser averages about 14 inches from head to tail, while the Greater is about 20 inches. If you get a little closer or have a good set of binoculars, you can also notice differences in their beak shapes and the amount of bare or patchy skin around their eyes. Like all parrots, Madagascar’s parrots are quite intelligent. They can also make quite a ruckus when a dozen or so of them flock to a small group of trees, with plenty of squawking when two birds go for the same fruit at once. They also have a nice whistling song of a few long pitches that they sometimes sing as they fly. I am told by the guidebooks that the species vary in the quality of their vocalizations, but I haven’t had enough experience with them both to tell them apart by sound. This guy looks like he's living in a black and white world! No parrot is that bland!